With a lineup that melds together top talents from some of modern rock and metal’s biggest and credible names, DEVIL YOU KNOW will be joining Italy’s LACUNA COIL on the road in North America this Fall. “We’re excited to be heading back out in States and playing our first-ever shows in Canada,” says frontman Howard Jones. The dates will mark DEVIL YOU KNOW’s return to American stages after making a splash in the UK and Germany on this Summer’s UK Sonisphere and With Full Force Festivals, respectively. 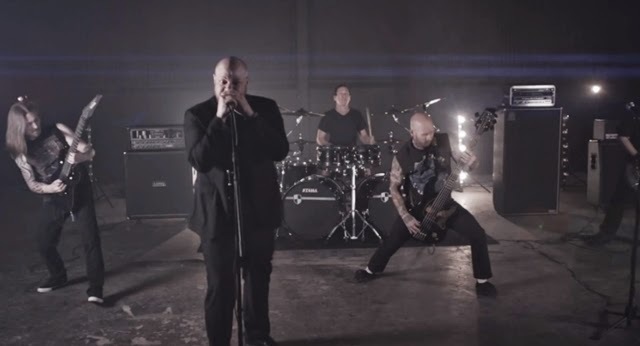 DEVIL YOU KNOW’s Nuclear Blast Entertainment debut, The Beauty of Destruction has garnered significant critical praise and worldwide sales, debuting in the U.S. Top Fifty on its release and winning “Best New Band” honors at Metal Hammer Magazine’s Golden Gods Awards in June of this year. “It’s been an amazing ride so far,” says Jones, who voiced the gold level, Grammy-nominated KILLSWITCH ENGAGE for nearly a decade. “Making the record was the first step for us. Now it’s up to us to keep getting onstage so that everyone knows this isn't a side project, but a true band." “There will probably be as much Italian spoken on the tour as English!” laughs Italian-born guitarist Francesco Artusato, also of ALL SHALL PERISH, who formed DEVIL YOU KNOW with Australian drummer, John Sankey, known for his time in DEVOLVED and collaborating with FEAR FACTORY. Fellow Italian guitarist Roy Lev-Ari and BLEEDING THROUGH bassist Ryan Wombacher round out the band’s lineup. LACUNA COIL will be continueing their world tour in support of their latest Century Media release, Broken Crown Halo. Ohio-based cinematic rockers, STARSET will open the shows.